From the playing field to the pulpit, from the classroom to the boardroom, Coastal Engraving has awards for any event or budget. From a figure on a base to a 6 foot 4 Post Trophy, we assemble all our trophies in-house, or you can choose from the highly detailed resin trophies. Our plaques and clocks come in a variety of sizes, finishes and plate designs. From the economy veneers, to traditional walnut, to the highly polished piano finish rosewoods or black lacquer, we can help you select the perfect plaque to suit your needs. For memorials or building dedications, nothing beats the elegance and lasting impression of a bronze plaque. Let us show you how perpetual plaques or trees can be a source of fund raising revenues for your church or organization. For a more contemporary award, these are your awards of choice. Acrylic and Optic Crystal Awards feature text engraving included in the price. 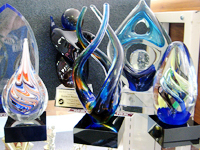 Check out our selection of the hot new wave in awards… Artglass. No two are alike, truly unique. Pins and Certificates. We are also your 1 stop shop for custom printed Ribbons and Certificates as well as cast or custom engraved Medals & Pins. While you are here, don’t forget a Tiara to recognize that special princess!